Current: What type of ductwork do I need? It’s a common question in HVAC circles. It’s even more important in laboratories. Selecting the wrong type of ductwork for your fume hood can be a painful and expensive mistake. So how do you choose? First, look at the application the ductwork will be used for. That is, what chemicals will you be using in the fume hoods that the ductwork will be exposed to? Depending on the application, you can select the most appropriate material for your ductwork. There are two main types of ductwork used in laboratories: Type 1 PVC and Type 316 stainless steel. Type 1 PVC (polyvinyl chloride) is the most versatile material for ductwork. It can be rigid or flexible. PVC offers high resistance to both acid and solvent vapors, making it a good choice for many applications. It is heat- and corrosion-resistant. For particularly corrosive applications, you may need PVDC (polyvinylidene chloride), a special type of PVC with high corrosion resistance. While not inexpensive, its cost is less than other types of ductwork. Type 316 stainless steel is a good choice when working mostly with solvents. It offers better corrosion and pitting resistance than lighter types of steel as well as higher strength at elevated temperatures. Do not confuse this steel ductwork with the kind at your local home improvement store. 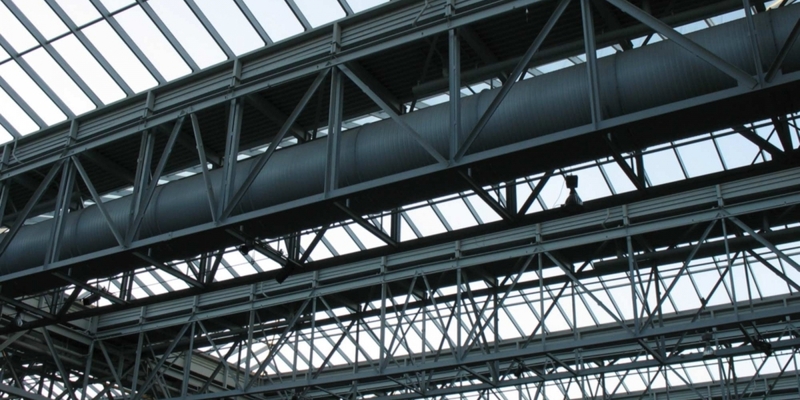 Those stores typically only sell galvanized steel ductwork. This is fine for general residential use but it is too weak to handle the corrosive fumes often found in laboratories. Other types of ductwork may be required for very specific applications. These can include fiberglass and glass. Accessories to ductwork may be required, such as a washdown system. Even the angle you install the ductwork at will impact its life. For example, if you’re using acids in the hood and have a washdown system installed, the ductwork needs to be angled rather than at a 0-degree horizontal to allow the water to easily wash down the system and drain into the hood’s drain trough. In any installation, elbows and angles should be limited as much as possible to provide a direct route for fumes to exhaust. Turns in ductwork add significant resistance. For example, every 12” diameter elbow adds 25 straight feet of equivalent resistance. One good practice is to add a minimum of three feet of straight duct before and after each elbow. This allows the air to straighten out so that the blower can work more efficiently. Also, make sure the duct termination doesn’t add extra resistance. Use a zero pressure weathercap instead of a cone-shaped cap or gooseneck termination. NFPA 45 states that exhaust ducts within a laboratory unit may be combined. However, NFPA 91 states that incompatible materials shall not be conveyed in the same system. This can be interpreted to mean that separate duct runs would be required. In all cases, it’s important to consult your state and local fire codes and speak with a laboratory HVAC specialist to ensure you’ve selected the best type of ductwork for your lab.